One might ask what is a dream, what is a goal? Goals and dreams seem to intertwine for me often but being more goal focused was for sure something that came more and more into my body here lately. This course stirred up a lot for me in that respect, goals seemed to melt in the light of the dream. And now I ask was those three weeks in Spain merely a dream? Is the dreamer dreaming the dream? of this crew, this mountainous place, and the 20 students from all over the world who converged into an experience of much sharing. The mountain and the water that flows from the springs supported us well as well as the brilliant fall weather. The leaves were changing colors in the distance always reminding us of the coming of winter but the brilliant sun allowed us to hang onto the summer of being. The epic tide of the moon brought energies circulating with us watching unforgettably its rise and setting over the mountains. And after the moon was full on day 2, eventually the darkness of the moon gave way to the starlit skies. The landscape was awe-inspiring including the always returning stunning display of colours and depths of the sunrises and sunsets. So when natures patterns are ever so present, then transformation really fast forwards with the PDC. So the journey of seeing with new eyes took place amongst a regenerating forest of mainly oaks of 60 years old. It’s a peak into the past landscape being managed for coppice for the charcoal industry but when the gas bottle came, well the local economy of charcoal and people living in the mountains vanquished. It was an apparent case study of how social, economic and environmental factors are interlaced in the web of life. I imagine back then deforestation was a major issue and it’s an interesting look at how forests have rebounded in some areas ironically with technology. Now the forest needs managed, thinned, biodiversity created, and food forests on a magnificent scale brought forth once more. Thus the design project reflected this pursuit to a certain degree. The land itself also benefited from several hands on sessions addressing real needs. In most cases, soils need to be healed on lands that once had intensive agriculture performed on them and this land indeed shows the same pattern. While the small garden was rich in some areas, the overall site would benefit for sure from a good dose of compost extract. Thus we took the first step of the process by attempting to build a hot compost. With the lack of true green material we probably added too much brown material and really lacked a true high nitrogen to kick the process really off. Over time after the initial build to make a 1.5 cubic meter pile, we continued to add water and cow manure which probably helped but a final monitoring never happened. In that case, the problem was the solution and the pile will slowly ferment and breakdown over winter with Mediterranean winter rains. Since we need more fungus in that soil, obvious by lack of breakdown in the brown parts of the grasses, this pile was actually exactly what we needed. And what the group needed in that day 2 moment was to move and do subtle team building through this hands on. We also had the opportunity to do tree care maintenance by pulling off the fences that were barely protecting the young trees from the wild goats. It’s amazing to see how trees struggle with grasses all around their base and continually being nipped at their growing tips. Some had even died back to the hardy rootstock. Thus we opened up the fences and did some chop and drop as well as light tilling and weeding to try and rid the trees of their interaction with the grasses. We then fed them well with a green/brown mix of food scrapes, old wood chips that were quite fungal, a touch of sawdust for a renewed carbon resource, cow manure, and the chopped green/ brown material that was a big part of the compost pile as well. We even did a bit of light pruning on a few trees to demonstrate that strategy of tree revival as well. Overall it was another great team experience with many hands making light work. 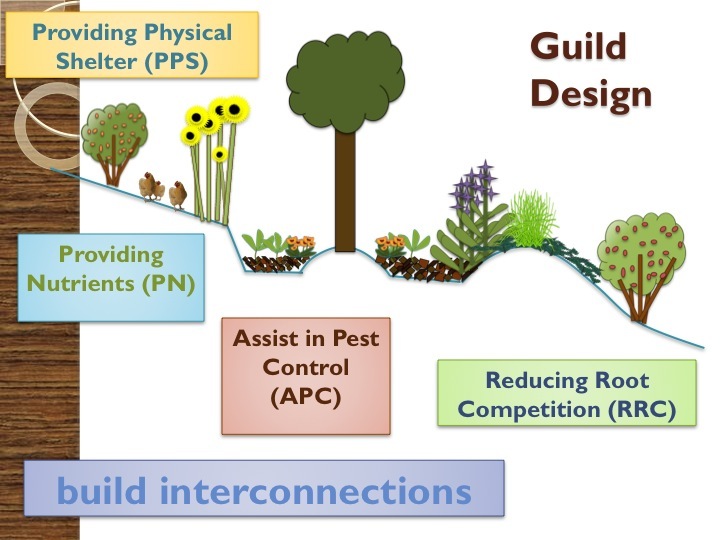 A community level response to biodiversity and its cascading effects. The guilds should come next and with a focus on plant propagation at the site I think it will possible. We had a light session on that during this course as well which I hope the students practice to gain more experience. Finally we tucked the trees away with the fences back up and some branches of previously felled pine trees placed on the outside to hopefully deter the goats from leaning up against the fence and biting. They are quite big animals but their feet are fragile and they often elect to not step on masses of branches as to not injure themselves. Lets see if all these techniques help but I do believe the positive energy at the very least make them happy for the moment. Also for hands on we did some garden work and planting. It was a small space so not the easiest hands on to handle but people ebbed and flowed throughout the time to also take a break from the intense schedule. And last but not least the tasty fermented delights we created! Morever, the schedule itself evolved and was very flexible and was really nice bringing in the voice of course assistant Roman and guest speakers Kate Curtis, Korbi and Martin. It was a truly great pleasure working with them and meeting students from so many different backgrounds and perspectives of permaculture. It shows how the movement is growing and this mountain time in the autumn of 2014 also helped each and everyone of us grow exponentially. Overall it was a big shift for me in the teaching landscape of permaculture, Spain not Portugal, and my outlook on the process continues to evolve. It is after all a great way to accelerate succession and evolution, zone 00 and the landscapes we touched physically. So I ask again, was it all just a dream? Where will the next steps be with this enlargement of the TreeYo Permaculture network? EU funds, investment in land regeneration, new teaching partners, travel opportunities or even energy more focused on the lake back in Kentucky. Who knows for now but these two weeks were special and indeed life changing. Thanks you to all who made it possible including that house on mountain that was the container for the course. Thanks again to all the students and their wonderful energy and vibration that was well maintained throughout the course. The network grows, where does it lead?